Aleida Olvera (COL ’20) and Roya Wolfe (SFS ’21), representing two of the four campaigns for GUSA Executive, took the stage in an ICC classroom Thursday night to debate questions posed by campus media and the audience. 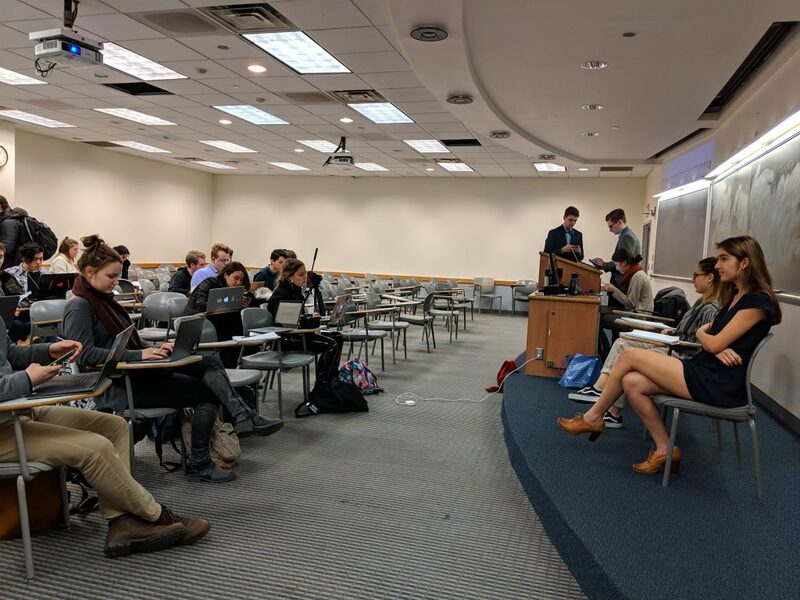 John Dolan (MSB ’20), running mate of Ryan Zuccula (MSB ’20), did not take the seat which the GUSA Election Commissioners running the debate had set up for him. Nicki Gray (NHS ’20) is without a vice presidential candidate after her former running mate, Sam Appel (COL ’20), stepped down from the campaign Tuesday, and did not take the stage. Olvera and Wolfe described broadly similar platforms which focus on some key issue areas, like sexual assault and misconduct prevention, mental health, and reconciliation for the descendants of the 272 slaves whom Georgetown sold to keep the university financially afloat in 1838. In their opening statements, the candidates recounted their experience with advocacy, but were careful to note that they had not previously held substantial roles in GUSA. Both candidates presented themselves as being disconnected from the student government establishment. Days before the debate took place, flyers reading “ABOLISH GUSA” appeared taped to surfaces around campus. They reflect a sentiment of dissatisfaction on campus—one which the candidates said they were attuned to, and which they hoped to address. 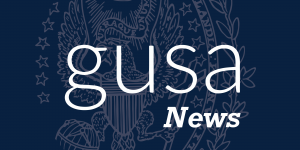 “We are going to constantly strive to see where we have gone wrong and what we can improve on through our tenure as GUSA executives,” Olvera said. Olvera said that she and her running mate, Norman Francis Jr. (COL ’20), would try to “restructure” the institutions of student government to serve students generally rather than just those who are members of GUSA. Wolfe, meanwhile, suggested that she and Sina Nemazi (SFS ’21), Wolfe’s running mate, would address GUSA’s perception problem with small initiatives. All four campaigns, including the two not represented there, have presented themselves as outsiders to student government. During the debate, Wolfe mentioned a series of less ambitious, less expensive proposals, including a “Zen Den” in Lauinger Library dedicated to meditation and stress relief. Wolfe was critical of the Francis-Olvera campaign for its ideas. Francis and Olvera’s website lists more than 20 policie areas and the candidates’ proposals for each, but most of them are only a few sentences long. Wolfe argued that the proposals were unworkable, and that GUSA does not have the weight to make them reality. Olvera rebutted, saying that GUSA does indeed have the power to make substantive change on campus. She said that her proposals were ambitious but achievable. “We are not promising something that we don’t think we can give,” she said. Meanwhile, Logan Arkema (COL ’20), a former GUSA Senator who ran unsuccessfully for GUSA President last year, has been collecting ideas for reform. In a Facebook post on Jan. 15, he sought to find others who might be interested in “abolishing / radically overhauling GUSA.” In a document available to all students, Arkema has listed some of the problems he thinks GUSA has, and some institutional changes which might solve them. Another student added to the list that, “individuals in GUSA put their reputation above actually helping the student body.” Arkema’s document does not provide an exhaustive proposal to reform GUSA. But that’s intentional, he said. “I don’t want alternatives [to GUSA] to be centered around my ideas.” He explained that previous attempts at reforming GUSA stretching back decades have failed in part because GUSA members have pushed for the changes. He said that he and others are planning events to gather ideas for more effective reform. No reform is likely before the GUSA Executive election is complete. The presidential debate, where all four campaigns are expected to appear, is on Tuesday, February 5. The election is on Friday, Feb. 8. The election’s winners will replace outgoing GUSA President Juan Martinez (SFS ’20) and GUSA Vice President Kenna Chick (SFS ’20) in March.